Airomé ultrasonic Essential Oil Diffuser, 100% pure Essential Oils and Essential Oils Plus | P.C. Fallon Co. Whether you’re seeking better health and enhanced vitality, or if you’re simply in search of delightful natural fragrance for your home, an Airomé Essential Oil Diffuser and 100% pure Airomé Essential Oils are an ideal solution. So easy to use – all you need is tap water and your choice of Essential Oil. Using ultrasonic vibrations, the Airomé Essential Oil Diffuser creates a soothing mist of water to spread the pleasant fragrance. Also offered are Airomé Essential Oils Plus, which combine 100% pure essential oils with all-natural odor eliminating technology. 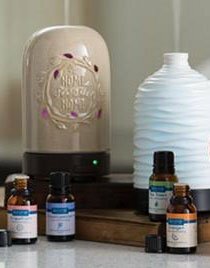 Both products can be used in an Airomé Essential Oil Diffuser to create a natural, spa-like experience in your home, office, dorm, or classroom. Essential Oils have been used for centuries by many cultures for curative purposes, and are enjoying a tremendous surge of popularity today. 100% Pure Essential Oils by Airomé are sought after by those seeking possible health and wellness benefits of aromatherapy, as well as others who crave refreshing fragrance without the use of artificial scents.